Supreme Court Justice Ruth Bader Ginsburg said Sunday that she’d like to spend "at least" five more years on the bench before stepping down. Ginsburg, who is 85, told CNN about her intention to stay on the high court until she would be 90. 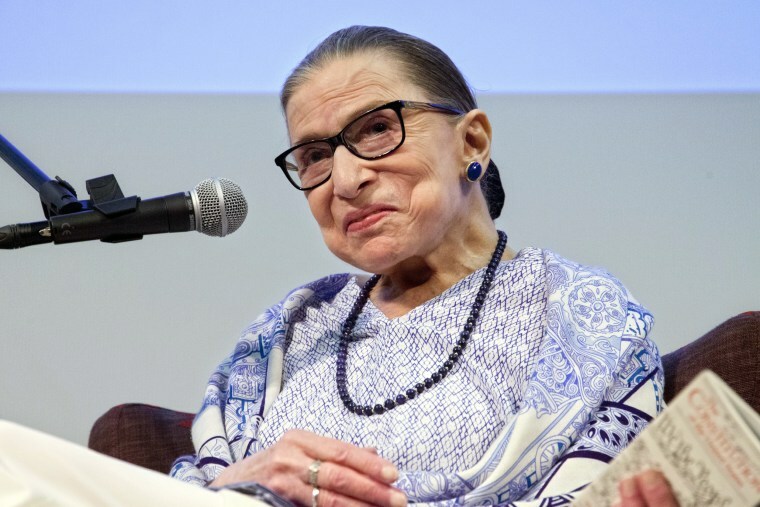 The network spoke to Ginsburg after she saw the play, “The Originalist” — a production about former Supreme Court Justice Antonin Scalia, who died 2016. Her comments came just weeks after President Donald Trump nominated Brett Kavanaugh, a conservative federal appeals court judge in Washington, to succeed Justice Anthony Kennedy on the Supreme Court. Kennedy, who had been a critical swing vote on the high court for decades, announced his retirement in June. Following Kennedy’s retirement announcement, and Kavanaugh's nomination, progressives have expressed concern that the court would be reshaped for a generation with a conservative majority of jurists who might further restrict or eliminate abortion rights, among other issues. Kennedy had been a swing vote on the high court who had sometimes sided with liberals on key opinions, including on the landmark ruling that legalized gay marriage. Those concerns have been compounded by additional worries that Ginsburg would retire in short order, due to her age, which would give Trump another court vacancy to fill.